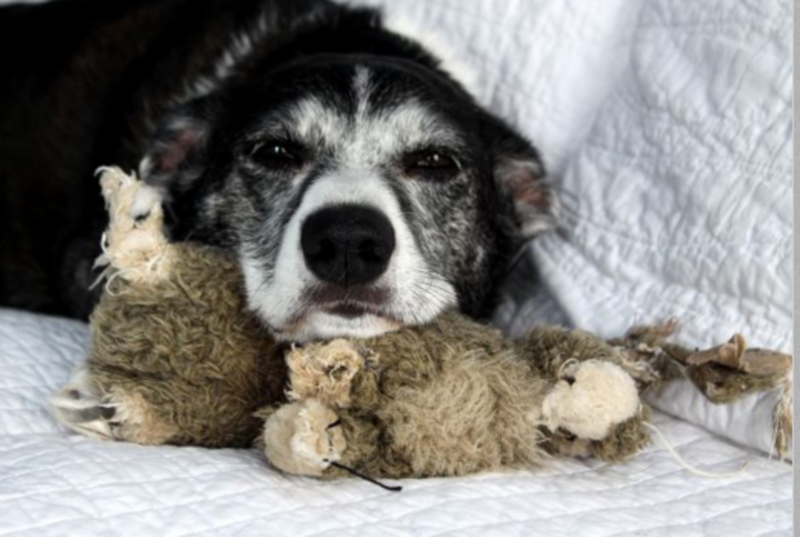 Just like us, dogs have several lymph nodes in their bodies, and just like us, they are prone to getting them inflamed or infected in certain circumstances which leads to their enlargement. Becoming aware of your dog’s lymph nodes can help you understand early signs of trouble so that you can report them promptly to your vet. Just as women are often instructed to perform breast self-exams, it’s not a bad idea for dog owners to get accustomed to how their dogs feel so they can readily recognize any suspicious lumps and bumps. So today, the dog’s lymph nodes will be the star of the day, so let’s see what they have to tell us! Hello, it’s your dog’s lymph nodes talking! We are special bean-shaped structures that are distributed on your dog’s body in various places. While we are scattered around in many places, we are mostly concentrated in clusters mostly found around your dog’s neck area, armpit area and inguinal area. You don’t normally feel us or perhaps you barely feels us when you pet your dog, which is a good thing! The fact that you barely feel us though doesn’t make us insignificant; rather, it’s an important sign that we are doing a very good job! As for size, expect us to be typically less than 1/2 inch in length on average, but the size really ultimately depends on the type of dog you are dealing with. Oh, and if you ever hear somebody calling us “lymph glands,” consider that’s incorrect. Unlike glands, we don’t secrete any substances! 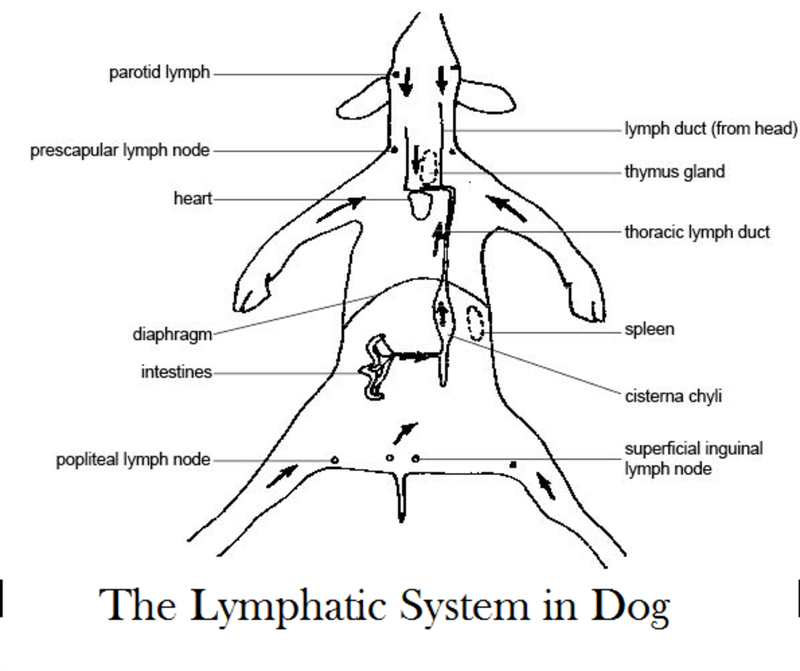 We are part of your dog’s lymphatic system, an extensive drainage network composed by several thin tubes (lymphatic vessels) which carry lymph, a colorless watery fluid that is similar to plasma. Where does this fluid come from? Basically, lymph fluid leaks out into surrounding tissues from your dog’s circulatory system. Oh, but don’t worry about this leakage! This is perfectly normal. 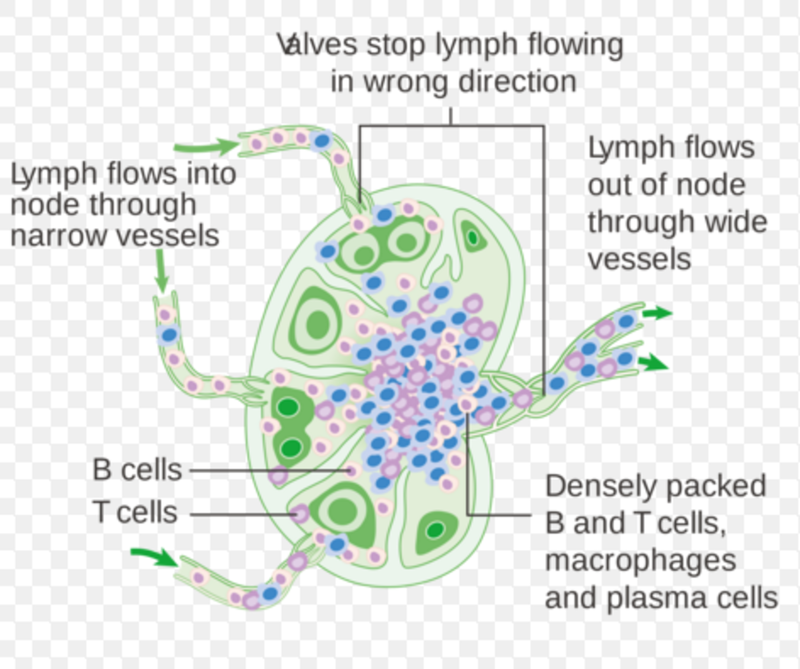 After collecting lymph fluid and then sending it through us, the lymphatic system then returns this lymph fluid to the circulatory system. This is a good thing. If the lymphatic system didn’t return that fluid, it would quickly build up in the dog’s body’s tissues causing swelling. While your dog’s liver and kidneys do a good job in filtering and getting rid of toxicity, us lymph nodes are responsible for filtering and removing any germs, foreign particles, fungi or damaged cells. You see, when the lymph fluid passes through us, it’s our job to filter it before it’s returned to the bloodstream. With the help of T lymphocytes and B lymphocytes, white blood cells responsible for fighting infections by attacking with specific antibodies, and macrophages, special white blood cells that engulf and digest any foreign substances, we are able to rid the lymph fluid of anything that shouldn’t be there so that when the lymph fluid is returned to the circulatory system, it’s as pure as it can be! As mentioned, you should barely detect us at all, but sometimes when we encounter something in the lymph fluid that shouldn’t be there, we will put up a fight. This causes us to swell up, which means that we are battling and trying to do our job the best we can. When we swell up, the condition is known as “lymphoadenopathy” which literally means enlargement of the lymph gland. Along with us becoming enlarged, we may cause other symptoms in dogs secondary to our enlargement such as problems swallowing when we we swell in the neck area, difficulty moving when when swell by the armpit, constipation when we swell by the inguinal area. When we swell, it’s important to consult with a vet to identify what is causing us to swell up in the first place. If we are swollen because of an inflammation or infection, the condition is medically known as “lymphoadenitis. ” Depending on which of us is inflamed, it’s often a tell-tale sign of something going on locally. For instance, if the lymph nodes by your dog’s neck are enlarged, it could be due to a sore throat, if the lymph nodes by the dog’s leg are enlarged it could be due to an infection in the dog’s foot. Why do we enlarge? In this case, we must blame the immune system’s response which involves the multiplication of lymphocytes and the arrival of macrophages, but this is all good as it’s our way of putting up a fight. Luckily, in these cases, once the inflammation or infection has been cleared, the lymph nodes should return to their normal size. While our job is to rid the lymph fluid from any foreign particles and other things that shouldn’t be there, cancer cells may sometimes infiltrate and wreck havoc. Where are the cancer cells coming from? In some cases, the cancer starts within us directly. Basically, what happens is that our lymphocytes become cancerous. It may sound ironic that these cells which are meant to be a line of defense, become cancerous, but unfortunately any cells in nearly any part of your dog’s body can become cancerous. When this happens, lymphoma, a cancer caused by the growth of abnormal lymphocytes occurs and this causes us to swell. As seen, we are quite important as we filter out all the bad guys! When we get enlarged this may be a sign of many conditions such as viral, bacterial infections, primary immune disorders, tick born diseases, reaction to vaccinations and cancer. For this reason, it’s important to check us out every now and then just to be on the safe side! Because many of us are located close to the surface of the dog’s body, we can be felt through the skin, and can be readily detected when we enlarge. Where should dog owners should check in particular? Veterinarian Dr. Demian Dressler suggests feeling under your dog’s lower jaw just where it connects with the neck area, in the front part of the shoulder area, by the back of the thigh, by the armpit and by the groin where the thigh connects with the abdomen. To see the exact location of certain lymph nodes in dogs that can be easily detected when enlarged, watch the video below for a demo by Dr. Sara. You can also ask your vet to show you. I hope this has helped you understand us better! 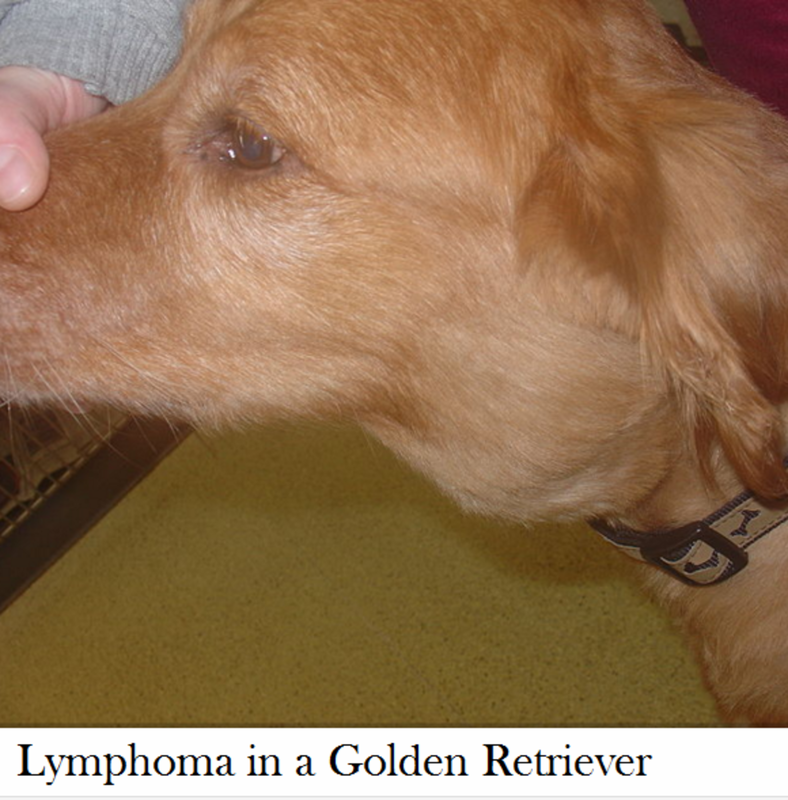 Pet Education, Lymphadenitis, Lymphadenopathy & Swollen Lymph Nodes in Dogs, by Dr. Race Foster, retrieved from the Web on April 11th, 2016. Pet Education, Lymphatic System, Anatomy and Function, retrieved from the Web on April 11th, 2016.